What defines authentic? Who is the arbiter of authenticity? Is there a higher standard that we hold some to and not others? What is an authentic Zapotec rug? Is it made only in Teotitlan del Valle? Can it be crafted in Santa Ana, Oaxaca, or can it be made in Santa Ana, California, by a Teotiteco who gets his wool from Teotitlan and weaves on a “traditional” loom? What about the weaving community of Diaz Ordaz – is it equally as authentic as Teotitlan? Must a textile be made with wool that has been prepared using traditional pre-Hispanic natural dyes or can it be made using chemical aniline dyes and still be considered authentic? If it is Zapotec hand-made, is that authentic enough? The Spanish introduced the fixed frame pedal loom along with sheep (and wool) with which to weave blankets and sarapes. Are post-Spanish conquest textiles made on these looms authentic? Why should we care? What about attribution? If a cousin makes a rug but it is sold under the master’s label with the famous man’s name on it, is it authentic? What if the maker only earns 10% of what the product is sold for? If a master Zapotec weaver is commissioned to make a Navajo-style rug by an art dealer in Santa Fe, New Mexico, and accepts the commission in order to earn enough money to feed his family, is this authentic? After all, an accomplished weaver would have made this Navajo-like piece by hand using “traditional” weaving methods. What is the difference between a Zapotec weaver making a Navajo-style rug and a Chinese weaver making a Zapotec-style rug? What if a rug merchant conducts and/or supervises the natural dyeing process and certifies that all the yarn used in the rug is naturally-dyed, but hires others to weave the rugs — is this authentic? What is the difference between a commercial enterprise and authenticity? Who will monitor and define what is authentic? Can we be authentic and earn a reasonable livelihood, being fairly compensated for time and talent? What is the range of acceptability for what is authentic and what is not? I’m interested in hearing your thoughts and opinions. In large part, I think, the consumer has responsibility for knowing what s/he is buying and supporting. “Do your homework,” a wise woman once told me. And that’s what I am asking you to do. 1. Tour guides receive 30-40% commission for bringing people to a weaver’s workshop. (There are some exceptions.) They likely won’t bring people to a house that does not pay commission unless you insist. 2. 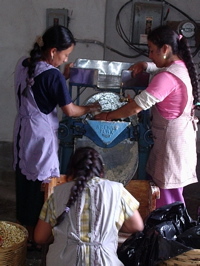 It is posited that only 8-10 families in Teotitlan actually dye their wool with natural materials. The rest will show a cochineal or indigo dyeing demonstration but do not employ this dyeing method for their tapestry-making. 3. Many of the textile patterns you see on Teotitlan rugs are Navajo derivatives or some combination of Zapotec and Navajo designs. Navajo designs were commissioned by importers in the 1980’s to fulfill the Southwest U.S. art market. 4. Chemically-dyed aniline rugs can be 40% cheaper than naturally dyed wool rugs. That’s because there are many more time-consuming steps to the wool preparation process and higher cost for the raw dye materials. 5. Chemically-dyed wool is environmentally toxic to the weaver and the local community. Breathing vapors causes lung disease and cancer. Discarded chemical dye water seeps into the ground water table. 6. Most people can’t tell the difference between a naturally-dyed and chemically-dyed textile. Can you?